AquaRelax is related to the AquaExtreme. The difference between both is that AquaRelax has 1 lounger instead of 2. It is a very royal spa for at least 6 people. You even have the luxury to use the cool icebucket for drinks. Aqua-Relax is one of the premium Evolution spas. 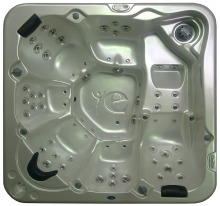 With the dimension of 220 x 220 cm it is a royal spa with a lot of space. Off-course this spa is equiped with the newest SV controller of SpaNET which makes it possible to heat up or cool down the spa with a heatpump. This heatpump and the powersave technology makes the spa incredibly energy efficient. Up to 73% less energy is possible. The new SpaNET controller is multiphase capable so no headache for the electricians anymore. For trouble free working there are no flow switches or pressure switches but only an optical sensor to detect the water in the heater. And off course, this heater is made of titanium but it is teflon coated to. The heater of the new SpaNET is variable between 1 and 6 KW. 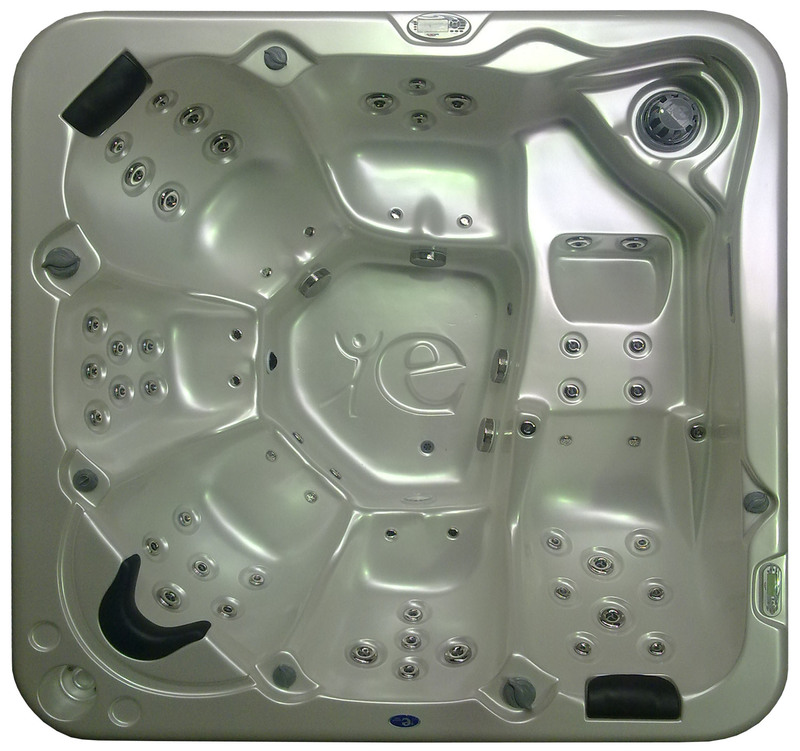 This means faster heating and when the spa is in use the heater simply reduce heat loss. The large (reversible) display shows you all you want to know and the menu buttons makes it very easy to program your spa the way you want. The Aqua-Relax spa is like every other Evolution spa equipped with the 3ZONE disinfection system. This system, a combination of Ozone with a special reaction chamber, UV and a 1-micron filter with silver-ion ensures you the clearest water with just a minimum of chemicals. Even without any chemicals like chlorine or brome when you use Aqua-Perfect. The 100% biodegradable water treatment of Evolution Spas. Because we all love some luxury, the Aqua-Relax spa has jetlighting (every jet is lighted), waterfall with light, extra lights for the cabinet and even an illuminated ice bucket to keep your drinks cool. Our LED lights are programmable, they have 30 different colors to choose and even the brightness is controllable. There is an Ipod docking station fitted in every Evolution spa and so you can enjoy your favourite music while having a bath. The music will reach you through the water by our special vibrospeakers which are mounted against the shell under the spa. With this SPATUNES music system you can even enjoy a vibroacoustic massage. The Lasting-Scents adjustable aromatherapy which is connected with the airblower brings you in the mood you want. Every spa comes with a 15cm thick cover, aluminium coverlift and steps in the color of the skirt.